Extra Extra - find out all about it. The new volunteer Visitor Centre with St Paul’s Church is offering information to those who want to make the most of a day in town. Here are some of the crack squad at the desk with copies of the new look tabloid Bedford Bulletin, a monthly printed publication which goes through doors across the county. It contains lots of What’s On events and always has a link to the town centre’s favourite website lovebedford.co.uk which has the benefit of being updated daily with information from the town’s shops, cafes and other businesses. 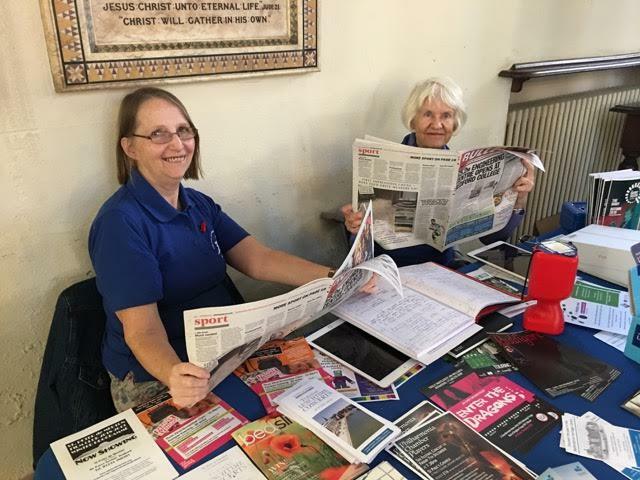 Said Love Bedford Director Christina Rowe: “We are very grateful to the volunteers at St Paul’s Church for filling the gap left by the closure of the Tourism Information Centre. Their service complements our activity in bringing people into the town centre seven days a week.